Description: Westbound pig train 21W slowly moves around Horseshoe. Description: NS 238 rolls across Zan Street making its way into downtown Orangeburg. Title: 238 by Clafflin Univ. Description: 238 lead by NS 8756, NS 2508 and NS 7146 rumble southbound to Charleston. Description: With a load of racks and automobile parts box cars. Description: 12N with a SD70M on the lead. Title: Horsehead Right in Your Face! Description: Another corn-made fuel train(65R) heads west off the Port Reading Secondary as a surprise for me, Lee King, and my little brother. Description: NS 20T Entering the Enola Yard. NS 25T and the yard switcher are on the tracks next to it. Note the New Holland Tractors. Description: A helper set heads back toward Welch. Description: NS 8756, a Dash8-40C, with a recently installed AC unit. Description: NS-42T southbound heading to Gainesville, GA after dropping off a long line of Grain cars in Toccoa, GA . 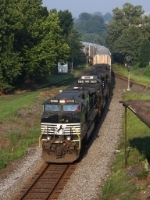 Description: NS train 60N, rock loads, southbound at Sycamore, GA on the GS&F district. Description: NS train 151 at Sunsweet, GA on the GS&F district with an RP-E4D slug in the consist. Description: NS train 151 southbound on the GS&F district at Dakota, GA. Description: Northbound NS #152 eases into Arabi to pull up behind #330 on the mainline to meet 2 southbounds which were in the siding. Locomotives seen here are in numerical order. Description: NS 5158, 8846, and 8756 sit off Lehigh St. in Bethlehem PA. Description: 36 locomotives stored in the old tie yard. Description: One of many stored at Debutts Yard.